Californians feel overloaded at work. But that’s just the beginning of their fears. When is the Golden State not so golden? Monday through Friday, 9 to 5, as it turns out. Or, for many workers, from 8 to 6 or even 8 to 8. That’s what we found when we surveyed Californians to find their biggest workplace fears. Our study revealed that California workers have more work-related fears than the nation at large—but they fear overwork more than anything else. Keep reading as we unpack Californian’s workplace worries to see just how legitimate and common they are (or aren’t). 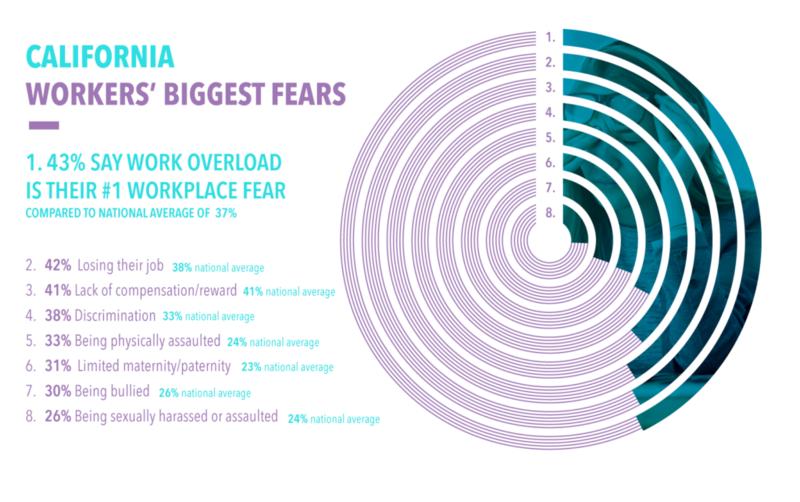 Of the eight fears mentioned in our survey, overwork scared Californians the most. Frankly, the fear seems well-founded. In the end, the industry might not even matter. Overloaded employees work in all sorts of roles—from entry-level jobs to CEOs—at all sorts of companies. Because when your boss asks you to work overtime, they probably don’t take your industry’s average hours worked into account. Individuals with children at home worry more about overwork than their childless counterparts. Millennials fear getting overworked far more than other age groups. Which isn’t to say that childless Baby Boomers don’t worry about work overload at all; they just worry at a lower rate than other groups. Here’s the kicker in all this: all that time at work might not even matter. Employees across industries report that much of their work time gets wasted each week—almost 50% in some cases—even in industries that get chronically overworked, like law and real estate.7 And the evidence shows that extra hours at the office don’t lead to increased productivity.8 In other words, all that Silicon Valley overtime is probably for nothing. While work overload scares Californians the most, they have other fears nagging at them, too. Job loss and low pay scare almost as many workers as overwork does. While work overload scares the most people (43% of respondents), job loss and lack of compensation were close runners-up, worrying 42% and 41% of Californians, respectively. Even less-common fears from our study worry a large percentage of California workers. Fears like bullying from coworkers or limited parental leave frighten fewer Californians than work overload does, but our study shows that almost one-third of Californians still worry about these concerns. In fact, for all eight fears we looked at, Californians hold these fears at a much higher rate than the nation at large. Before you dismiss California workers as a bunch of scaredy cats, we should tell you that 73% of Californians have experienced one or more of these fears in the past year. Suddenly, those fears sound pretty justified. The California workplace might be scary, but the state still has a lot going for it: from national parks to innovative businesses to low property taxes, there’s much to like about the state. Scary stuff, right? For your own sake, don’t wait; face your (workplace) fears. Because the Golden State should stay golden—even during the workweek. Hey California, did our study get your workplace fears right? Tell us in the comments below!